The summer is coming, and so is the vacation season. You've already chosen your destination, got your vehicle serviced and ready for the long trip. But there is one thing that bothers you year after year: whenever you stop for the rest, the summer sun does its best, and raise the temperature of your vehicle to the unbeatable level. That's why you need a car umbrella: an evolution car cover for your vehicle. Not only does this umbrella help protect your car from sunlight; it'll also contribute to protecting it from acid rain, bird droppings, dust, and more. There are different colors available for you to choose from to give your car umbrella a more personalized look. Cars battle the elements as much as we do. Rain and heat can cause havoc upon both their exterior and interior. If you have an uncovered parking space then you sure know what I'm talking about. Even if you do have a covered space, you'll still need to park your car in uncovered spaces very often, and the same conditions will affect your car in the long run. Prolonged exposure to rain can cause damage to the metal outer body of your car, reducing its working life. On the other hand, exposure to sunlight can cause your exterior paint to fade quicker. 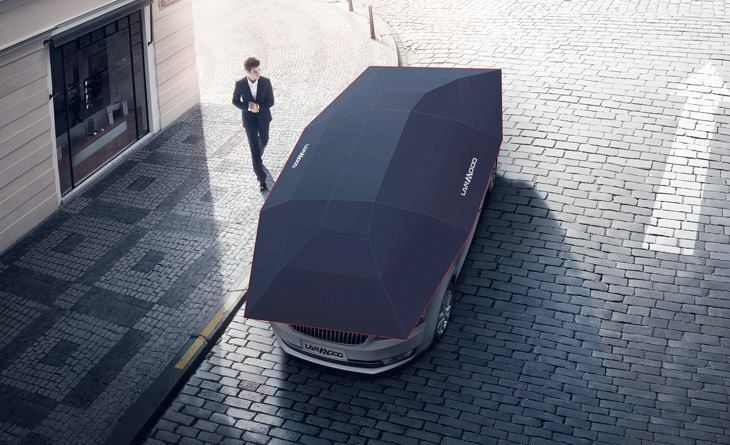 A special design allows the umbrella to cover the whole vehicle. It also provides a space between the roof and the accessory to keep the car away from direct sunlight. 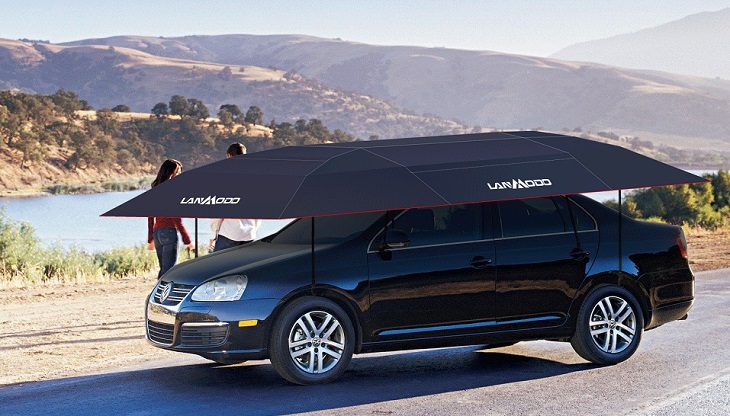 As a result, a car covered with the Lanmodo umbrella is about 36 degrees cooler than an unprotected one. Are you afraid that someone will steal it? There are two wires present in the prevent theft rope, and they won't be cut so easily. This innovative umbrella is going anywhere! The best solution for your problem is Lanmodo Car Umbrella. Lanmodo Car Umbrella offers a wide range of advantages. This car umbrella comes in two variants: auto and semi-auto. In this overview, we'll stick to the first one. After you've bought and opened the package, you'll notice the wireless remote controller inside. 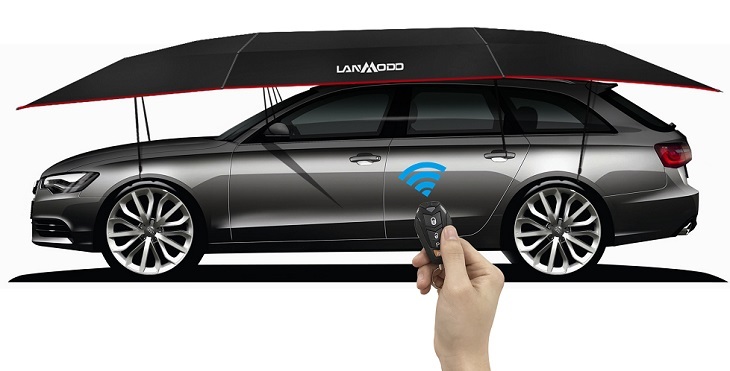 You will need just about 30 seconds to mount this gadget on your roof, as well as one click on the button will open and fold the Lanmondo car umbrella in just 8 seconds. You will also get a warranty card and user guide. You're not going to seat in a heated car never again. This spectacular car umbrella will decrease the interior temperature up to 36 degrees Celsius. It is so compact and can be easily packed in your cargo space. It will take just 85cm of your storage space. Even your little ones will be able to bring it from the back of the car since it's weight is just 6kg. When installed and fully opened, the umbrella's dimensions are 2100mm x 3500mm, so it can fit multiple vehicles. Your roof will never be directly exposed to sun waves, thanks to the anti-heated theory. The cleaning of your vehicle's top is going to be a piece of cake from now on. The Lanmondo Car Umbrella will prevent dust, bird droppings, ultraviolet waves and acid rain to interact with your roof. The umbrella is powered with 8-slot brushed motor, supplied with motor power of 10W. The Lanmondo Car Umbrella is designed to satisfy every customer. The people in charge of engineering made sure to patent their folding structure, and made it very stable and highly responsive. At the end, they even succeeded to incorporate Double Windproof feature, that will help the umbrella to stay where it is supposed to be: firmly attached to your vehicle. On the other hand, it won't make a scratch on your car, thanks to the high-quality materials used for its production. It is obvious that car umbrella will be a great new asset to your driving park, and it is going to be an unavoidable addition to all your road trips in future. 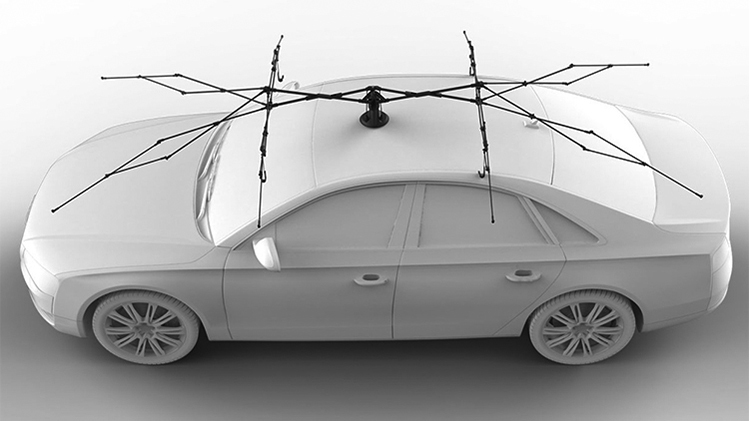 The manufacturers of the Lanmodo Car Umbrella promised even more accessories which will provide some new features.